A Guinness World Record has been officially set by the hundreds of community members who participated in the February 4th “Light Up State College” event that featured a record-setting 5,622 ice luminaries filling Allen Street in downtown State College. “We wanted to transform Downtown State College into a winter wonderland and achieve a world record, but we knew we needed the community to make it happen” John Stitzinger, event organizer and a founder of The Make Space, said. Stitzinger received a grant to fund his idea via the the Knight Cities Challenge (KCC), which funds ideas to make communities more vibrant places to live and work. Ideas like Stitzinger’s are eligible for KCC and other granting programs sponsored by the Knight Foundation through the greater State College area’s designation as a Knight Community. Centre Foundation has a long-standing relationship and is proud to partner with Knight Foundation on these types of innovative projects. The previous world record was set in 2013 by the residents Vuollerim, Sweden, who made 2,651 separate lanterns. A team of several dozen volunteers began setting up on Allen Street in the morning and worked for several hours until the drop-off time arrived. By 2:00 pm, a line had formed at the drop-off table as community members, kids, and families began bringing their frozen luminaries from home. Many had frozen multiple luminaries, with 21 being the most from a single household. 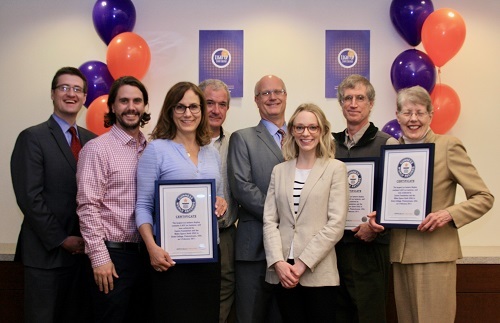 “This world record was made possible by the thousands of Centre County residents and many volunteers who came together to showcase the amazing and connected community we are a part of,” said Commissioner Michael Pipe. According to Guinness, ice luminaries are cup-shaped structures made purely out of ice that hold a light inside. Instructions on how to make one can be viewed at LightUpStateCollege.com. Shortly after 6:00 pm, the sun had set, all 5,622 luminaries were set-up and lit, and the official count and required five minute waiting period had passed. It was time for the crowd to enjoy what they had accomplished together. Hundreds of people patiently awaited their turn to stroll through the meandering path of glowing luminaries, pausing for the obligatory picture and enjoying the record-setting evening. The Make Space is a nonprofit, community makerspace and workshop tailored to anyone who enjoys creating new things, sharing knowledge and working across boundaries in the arts and technology. The volunteer-run organization holds an open house at the space every Wednesday at 6:00 pm at 141 South Fraser Street in downtown State College. For more information about this record-setting event, please visit LightUpStateCollege.com. To print your own certificate, please click here. And, to view a video of the event, please click here.